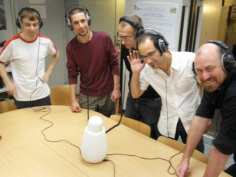 I would like to thank Dr. Nicholas Miisdaris and Dr. Patrick Susini for inviting and hosting me as a guest researcher in the Sound Design and Perception team at IRCAM in Paris from January to June in 2009. During that time I was privileged to observe and take part in some their experiments on affective responses to sounds, the design of sounds to enhance products, and the CLOSED project on closing the loop between sound evaluation and design. My blog of the sabbatical is titled Sous le Toits de Paris after Rene Clair’s avante garde movie in which he applied the principles from his manifesto on the Art of Sound in the design of the sound track to only convey “contrapuntal” elements that were not visible on the screen.